Following a tiring but relatively trouble-free journey to our hotel, located in a small town near Dusseldorf, we were treated to a substantial buffet meal at the hotel on our arrival. The coaches took us to Bonn and as it was Sunday most of the shops were shut, but it was still possible to find good food at one of the many cafés and restaurants, or even in the market place where numerous stalls were selling foods from around the world in front of a live music stage. Most of the orchestra met for the start of the Beethoven tour, which then split into two groups for a short tour on foot of the old city centre and entrance into the Beethoven museum house. 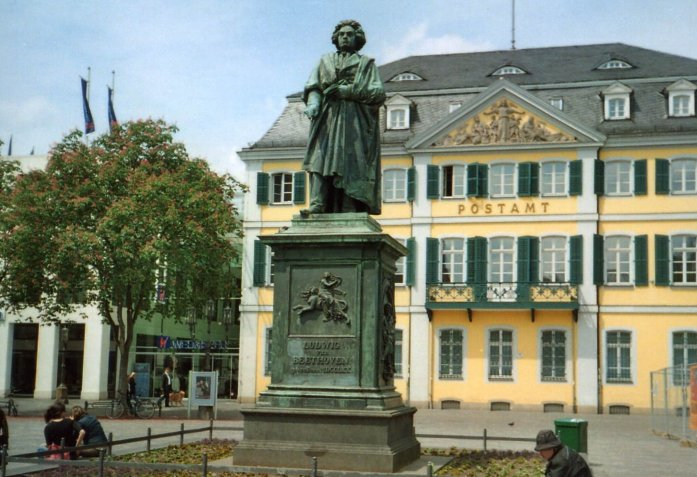 I was in the first group and our guide told us the history of Beethoven’s family and his involvement in Bonn as we walked around the city centre. What stuck most in my mind was that almost all the historic buildings we looked at had been partially or completely rebuilt to the original drawings, since our guide made a point of telling us that seventy percent of Bonn had been bombed in the second world war, including the cathedral, and grand university buildings. Our tour concluded in the Beethoven house where we walked through each room listening to our guide telling us about the history attached to the many artefacts including paintings, sculptures, old musical instruments, music scores, and even Beethoven’s death mask. Late in the afternoon our coaches took us up to Petersberg, situated on one of the many steep hills that overlook Bonn from the east banks of the Rhine. The delicious tea and cake was well received, and afterwards we took in the views over Bonn and the surrounding area from the high vantage points around the hotel. In the evening we were free to entertain ourselves, and a number of us found a local restaurant to have dinner. As had been the case since arriving in Germany, the food and drink was much enjoyed. Our tour coaches took us to the Friedenskirche in Krefeld to offload our instruments before we were taken on a guided coach tour around the town, and given an insight into the history and industries of Krefeld. After finding a place to eat and returning to the church, the orchestra came together for the afternoon rehearsal. Between the rehearsal and the evening concert we had been invited to attend a reception hosted by the Mayor of Krefeld at the town hall. 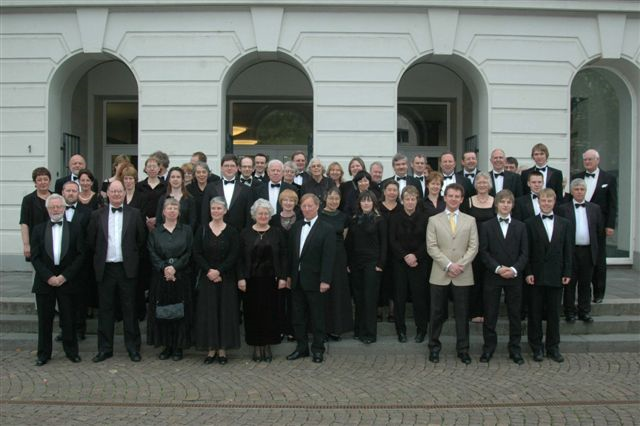 Mayor Karin Meincke gave an eloquent and well-prepared welcoming speech in English and invited members of the orchestra to sign the town hall visitors’ book before we moved on to the refreshments. The concert was fully attended by an appreciative audience, including Lord Mayor Gregor Kathstede. The orchestra started well, supported by two local professional double bass players, and marked performances from our brass and woodwind sections. With the audience warming to our performances of ‘Overture to Oberon’, ‘In the Steppes of Central Asia’, and ‘Three Bavarian Dances’, we paused for the interval and returned for a thrilling rendition of Tchaikovsky’s 6th Symphony. This was evident particularly from the spontaneous applause and shouts of “Bravo!” after the rousing third movement, followed swiftly by the more tortured and sombre fourth movement. As an encore, we had prepared Elgar’s Nimrod, and our audience welcomed the opportunity to applaud once more to finish the evening. Our trip to Aachen took us to the Kurpark buildings to offload our instruments, and as the weather was unpredictably rainy an indoor stage was set up. Before the afternoon concert we had some time to explore Aachen town centre, and after discovering the extraordinary cathedral we found a place for lunch. For this concert we performed a shorter one-hour programme with no interval, missing out the first and last movements of the symphony. 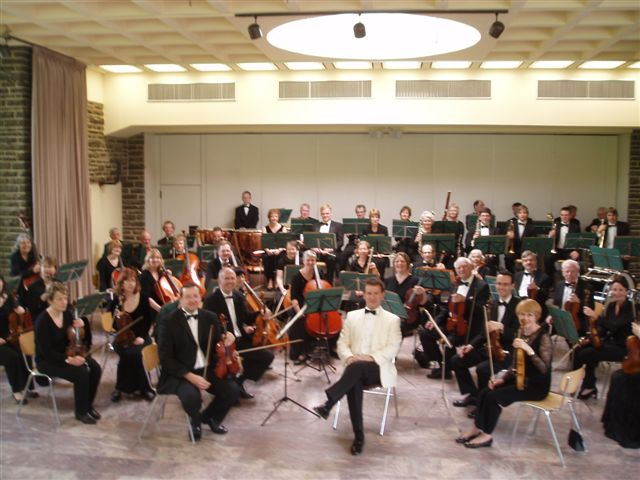 This was a much more relaxed performance but just as enjoyable, with the audience consisting of local people, and friends and relatives of orchestra members, including a number of small children. The enthusiasm of the audience again prompted the performance of Nimrod. 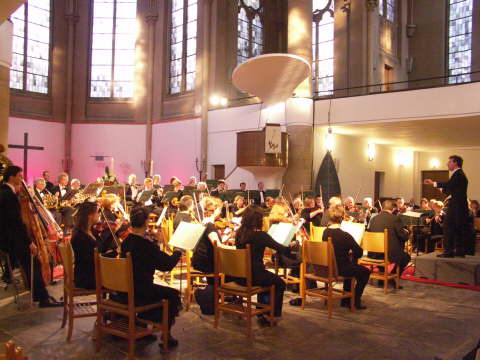 For the evening, an orchestra meal had been arranged at a large restaurant in Dusseldorf, and we proceeded through rush hour traffic and road works into the city. There was some confusion with the waiting staff as to who wanted which meal, but eventually everybody received their food and beer and we settled into enjoying the meal. We loaded the coaches for the final time and left the hotel where we had enjoyed food, drink, and pool over the previous four nights. The journey home took us near to Delft in Holland where an hour’s break had been planned. Due to a late departure and traffic we decided to carry on to the ferry port with only a short stop at a service station. The crossing to Harwich was particularly rough and as we were being thrown from side to side, and plates in the restaurant crashed off tables, I began to summarise the tour. A combination of good organisation, welcoming hosts, good music and the gaining of new friends in the orchestra had made this the most enjoyable tour I had been on since joining the orchestra eight years ago. No doubt we will be organising another tour for two years’ time and I’m looking forward to it already.